If you are having trouble viewing this email click here to view in your browser. Siser Heat Transfer Days are here again! He's Back! and this time it's National! This practical workshop will fundamentally change how you think about marketing your business. Mutoh America, Inc. launches new Dye-Sublimation Ink, "DH-21"
Mutoh launches new Dye-Sublimation Ink, "DH-21" Mutoh a leader in wide-format inkjet printers a..
Durst targets more converters with Tau 330 RSC E launch Durst, manufacturer of advanced digital..
Digital Ink Sciences Announces New Dye Sublimation Ink for Wide-Format Textile Printers Digital..
Jet Technologies offers new laminating films Jet Technologies has launched a new textured matte..
InkTec kick off 2019 with three new JETRIX printers The New Year looks bright for South Korean ..
Get your discounts on Dye Sublimation! We're having a stock clearance! 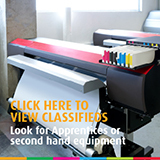 as trade associations running PacPrint, Printex, Visual Impact Expo, VI enews and VI magazines - Unsubscribe. The email was sent to | send to a friend.